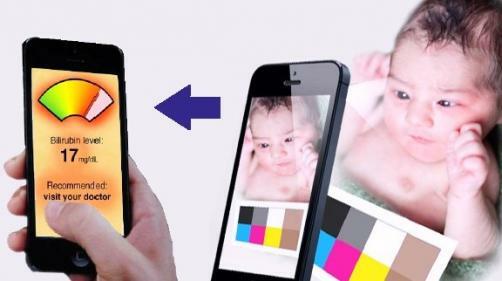 A smartphone application being developed is likely to be able to help healthcare providers and parents detect signs of jaundice in newborn babies. Skin turning yellow is a sure sign that a baby is jaundiced and isn’t adequately rejecting the chemical bilirubin, but that discoloration is sometimes hard to see and severe jaundice left untreated can harm newborns. Engineers and doctors at the University of Washington (UW) have developed a smartphone app that could serve as a screening tool to determine whether a baby needs a blood test – the standard for detecting high levels of bilirubin. According to research presented last week at the International Joint Conference on Pervasive and Ubiquitous Computing (UbiComp 2014) in Seattle, Washington – the so-called ‘BiliCam’ application can deliver results to parents and pediatricians within minutes. Jaundice is the result of build-up in the blood and tissues of the body from the substance called bilirubin – which is a natural byproduct of the breakdown of red blood cells. Normally, the liver metabolizes excess bilirubin, but in newborns this process can be slow because the liver is not yet functioning optimally. The UW team’s effort combines a smartphone app with a color calibration card and algorithms in a cloud, which is said to give very quick results. The app was tested in a clinical study involving 100 newborns and their families in the newborn nursery at UW Medical Center. The researchers involved say that the BiliCam’s accuracy was better than visual exams, and point to past research showing that doctors using the visual method may also tend to underestimate the degree of jaundice, which is a cause for concern. But it may be a while until the technology can be deployed as it will need FDA approval. The UW team expects that within a year doctors will be using BiliCam as an alternative to the current screening tool for bilirubin.